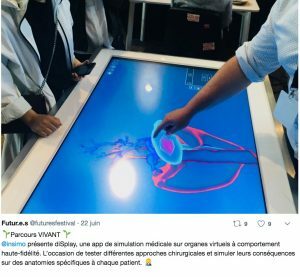 The 15th June 2018, InSimo presented its Surgical Planning Simulation software, diSplay Learning, at the event Futur.e.s in Paris. 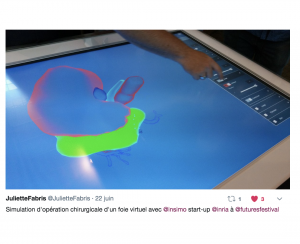 The 21, 22 and 23 June 2018, InSimo participated to the ninth edition of the biggest and free European festival dedicated to digital innovation: Futur.e.s (ex-Futur en Seine). 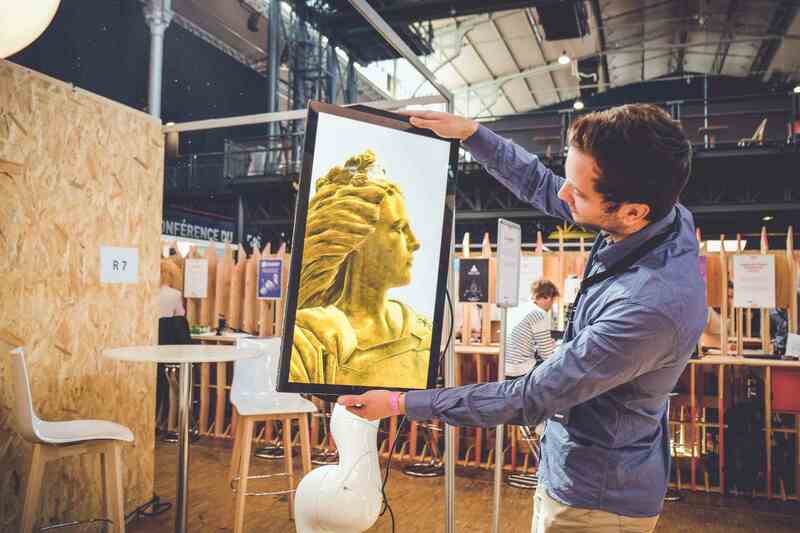 Created in 2009 by Cap Digital, Futur.e.s returned to Paris for a three-days festival at the Grande Halle de la Villette. More than 20.000 visitors, among which a large number of professionals from every business sector, have been welcomed. The format of this year’s edition proposed an unprecedented experience around the theme “Various futures are possible” (“Plusieurs futures sont possibles”). To present the latest French and International innovations to the grand public. Futur.e.s Festival, Grande Halle de La Villette, Paris 2018. InSimo participated to the pathway “Rewriting the living: nature, health, food“. Nowadays, are we able to ignore the limits imposed by nature? “Rewriting the living” has been a pathway focused on the ability of human beings to rewrite the relationship among men and nature. This journey was all about the brand-new technologies that seem to be capable of changing the coexistence between the human and the nature, finding new opportunities to increase the quality of life. 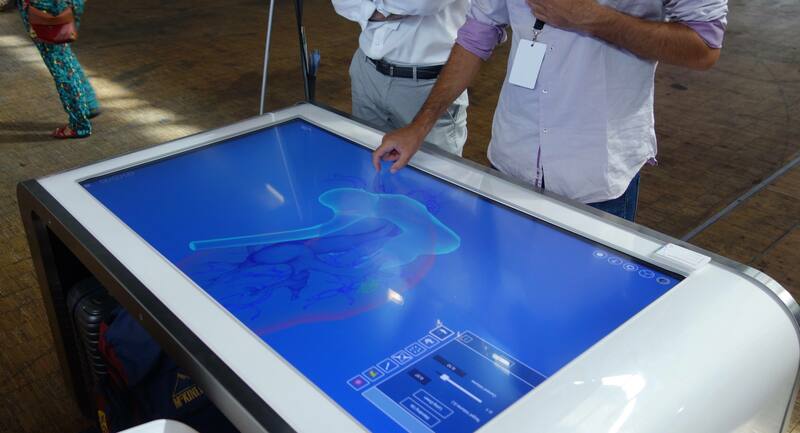 For InSimo, to « rewrite the living » meant to provide a surgical simulation software. 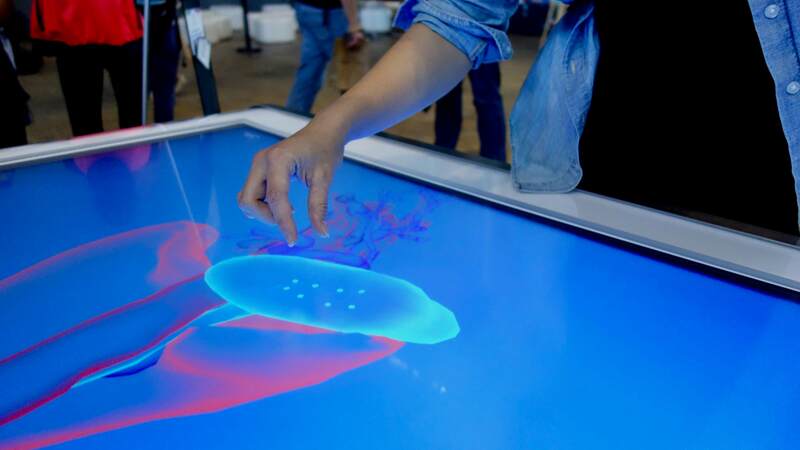 Developing organ models with biological behavior and high-fidelity mechanics in virtual reality, InSimo presented the latest prototype of diSplay Learning. The software will be released in September, with the objective of supporting students and surgeons in the choice of the best operating strategy for a specific patient. 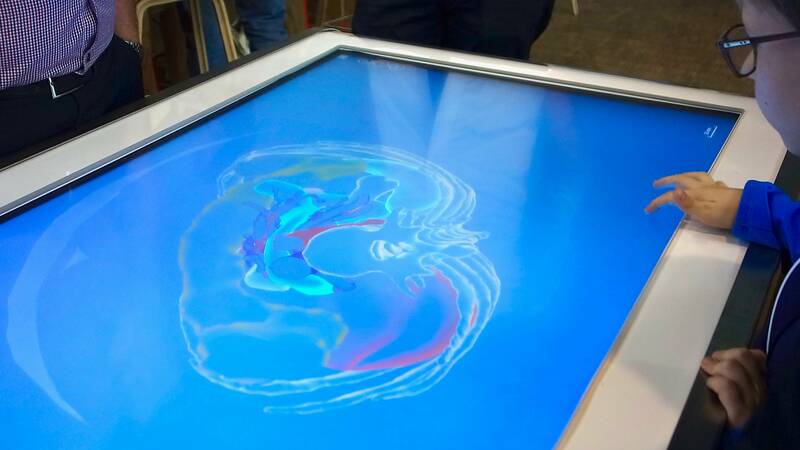 On a virtual anatomy reconstituted from the scanned images of a patient, the surgeon or the student will be able to reproduce the process of a certain surgical procedure envisaged. 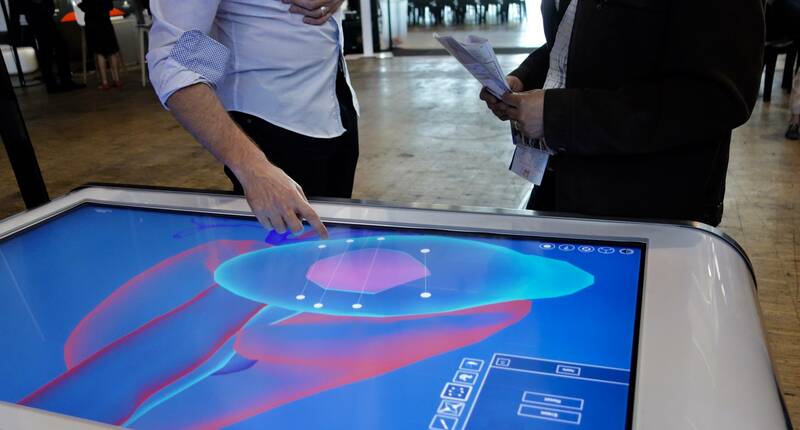 The simulation then makes it possible to calculate the consequences of the gestures implemented and to virtually visualize the organs impacted by the surgery. The user can then determine the best approach for each proposed patient case. 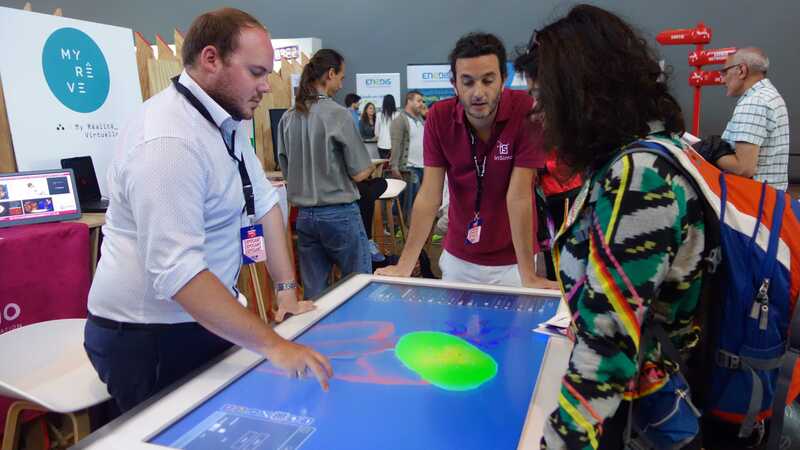 Thanks to the collaboration with the team of Itekube, InSimo proposed to the audience a diSplay Learning demo on a 55 inches tactile table. 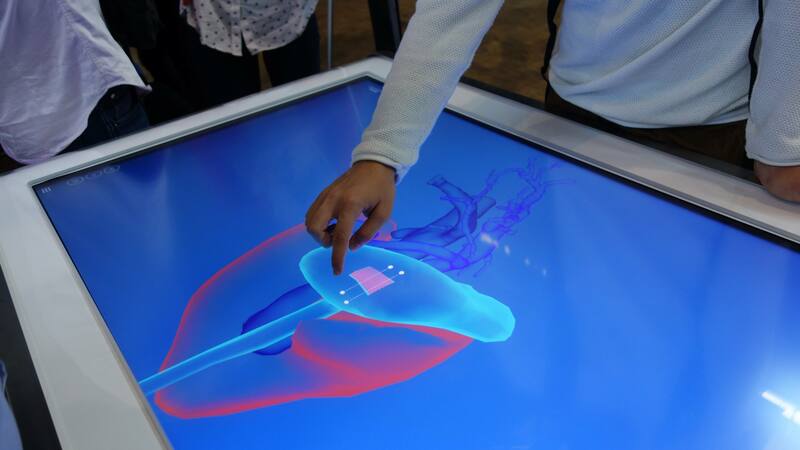 Through an immersive experience, the audience was able to manipulate the 3D models of organs and to predict the consequences of their actions on a virtual patient, exactly as students or surgeons would do while using our Surgical Planning Simulation software. Incisions and sutures can be performed in very different ways, and different ways of conducting a certain surgical operation have different impacts on the general outcome of the surgery, and consequently on the health of the patient. This was the message that InSimo tried to bright during each of its demo on the stand of the festival. Go find some videos on our Surgical Planning Simulation software, diSplay Learning on our Youtube Channel! 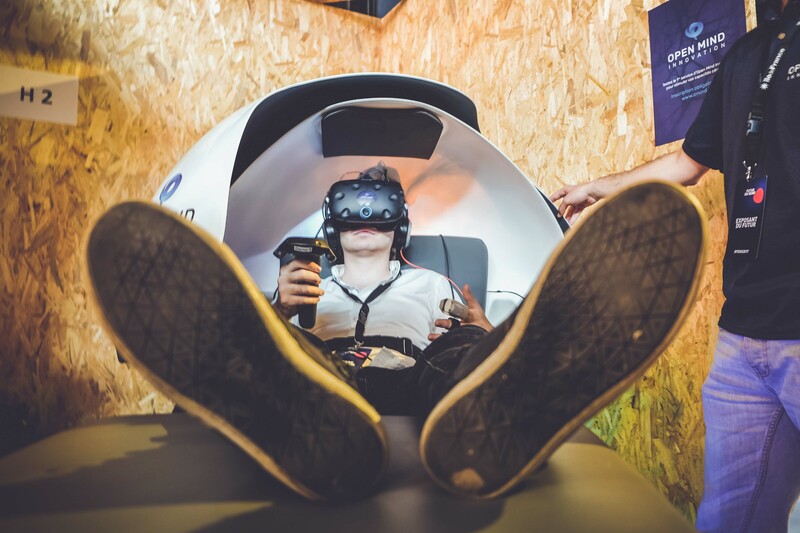 During the 3-days-festival, visitors were invited to imagine the world of tomorrow and to take over their future while walking through a journey of six thematic pathways. 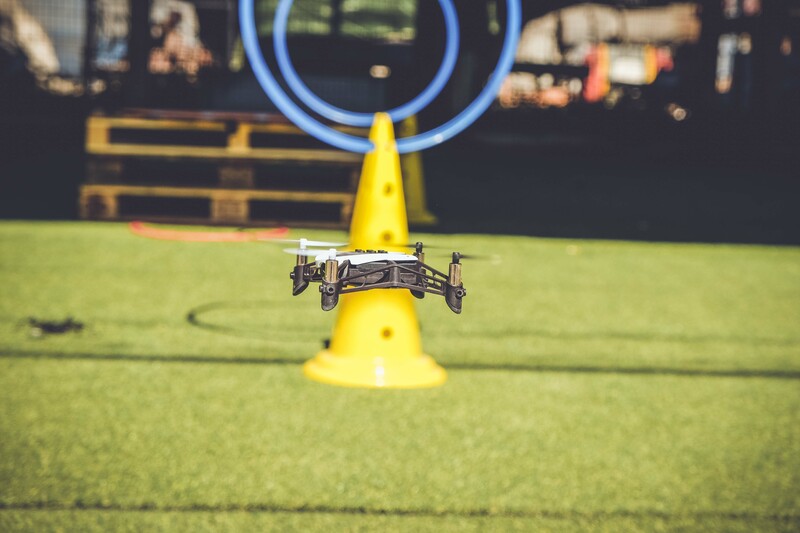 Several were the subjects touched during the journey created by the festival: technological acceleration, climate change and territories, the impact of technology on health and food, artificial intelligence, algorithms and big data. 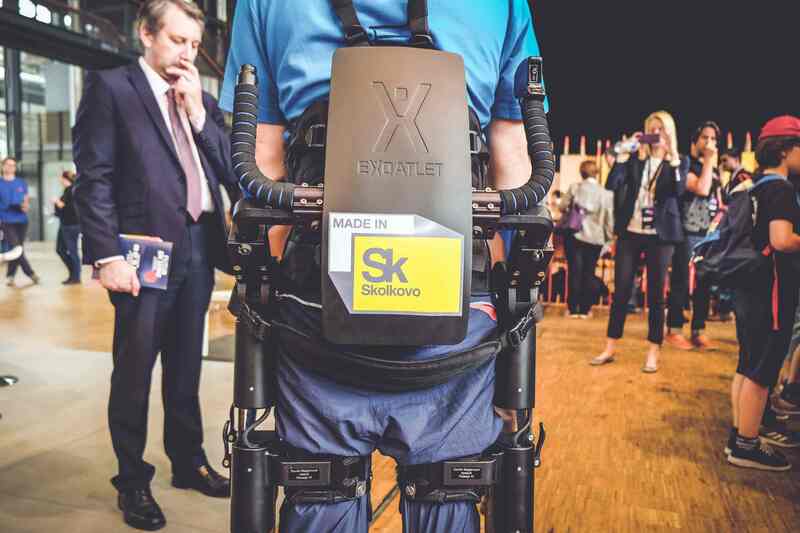 Each one characterized by a different subject, the pathways allowed the public to discover more than 70 demonstrations and prototypes of the international and French start-ups present in the fair. Participants were asked to collectively think and build the world of tomorrow, to explore innovation issues and to propose innovative solutions to the brand-new queries of the future. Several pitch zones brought together incubators, investors and innovators. 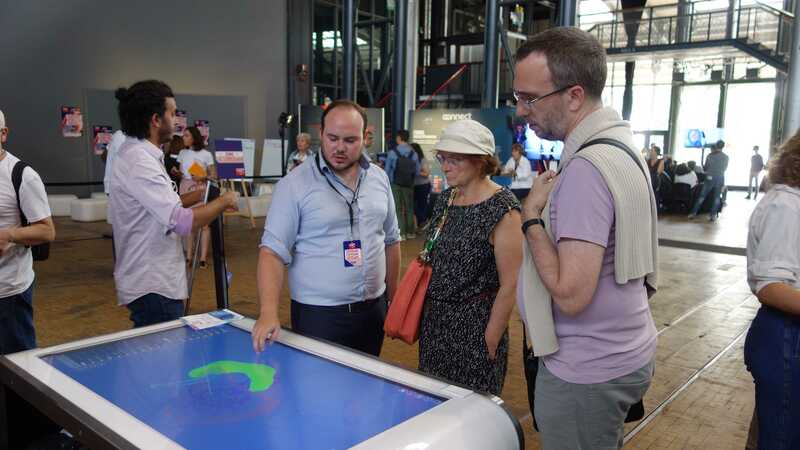 Business tours for internationals and for the French public were promoted in order to discover the key places of innovation in the Ile-de-France Region. Design labs offered collective sessions of reflection and brain storming. 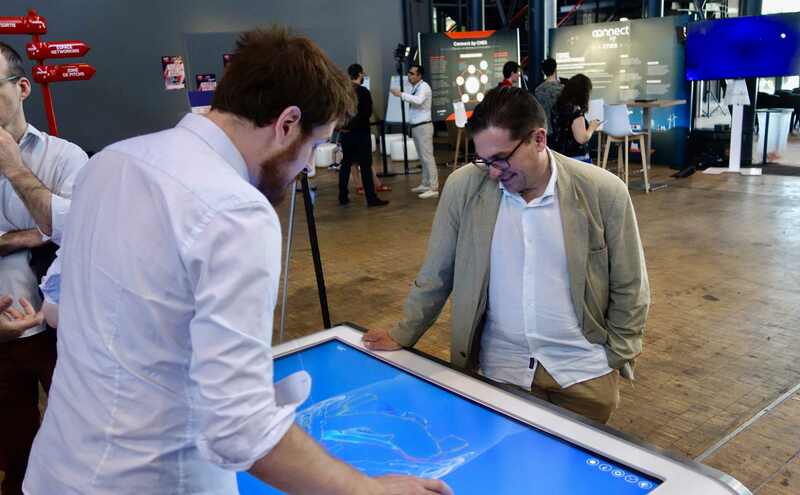 The presence of French and international speakers has rendered Futur.e.s a festival to the scope of everyone, questioning the public with dilemmas on the vision of their future. The international festival on digital innovation has been the venue for conferences, keynotes and masterclasses, to question and take ownership of the future, giving voice to actors and thinkers of change. 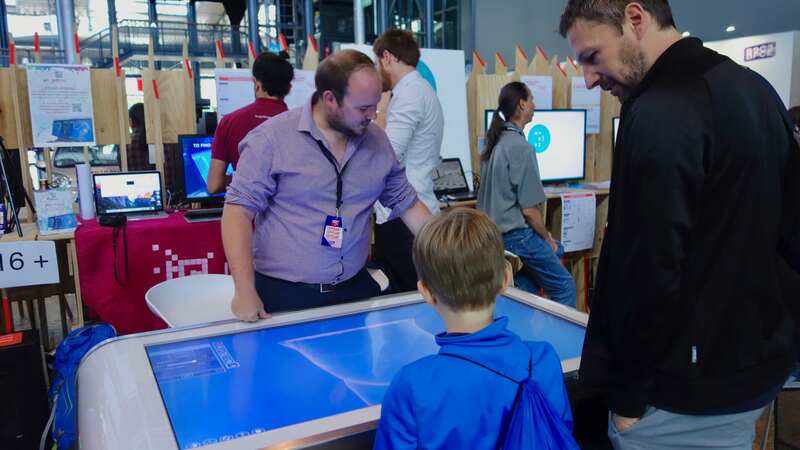 A demo space, workshops to experiment the latest innovations and a hackathon dedicated to the future of professions allowed Young visitors to enjoy a moment of digital discovery. 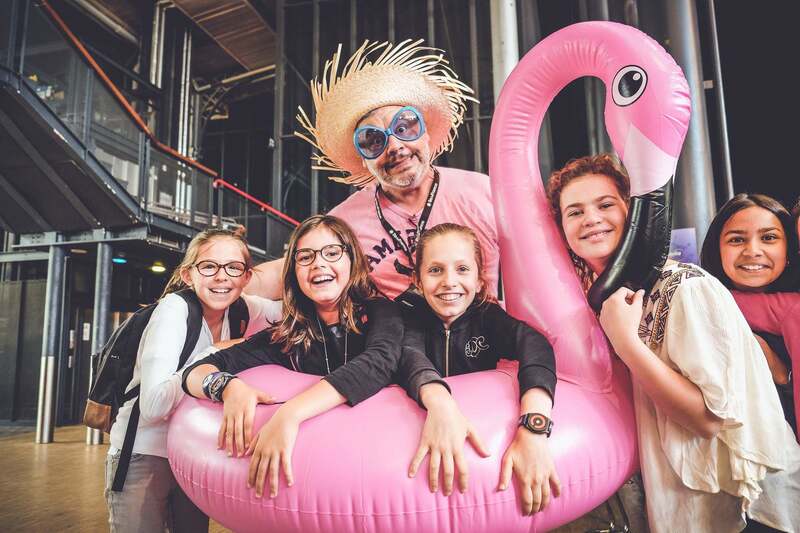 For the youngsters, the festival collaborated again with the association Startup For Kids to offer children and teenagers the opportunity to explore new ways to learn and grow. 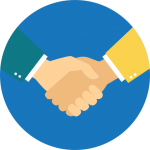 Futur.e.s is an event that promotes the creation of entrepreneurial and investment opportunities, by establishing new partnerships among industrials, businessmen and the media. 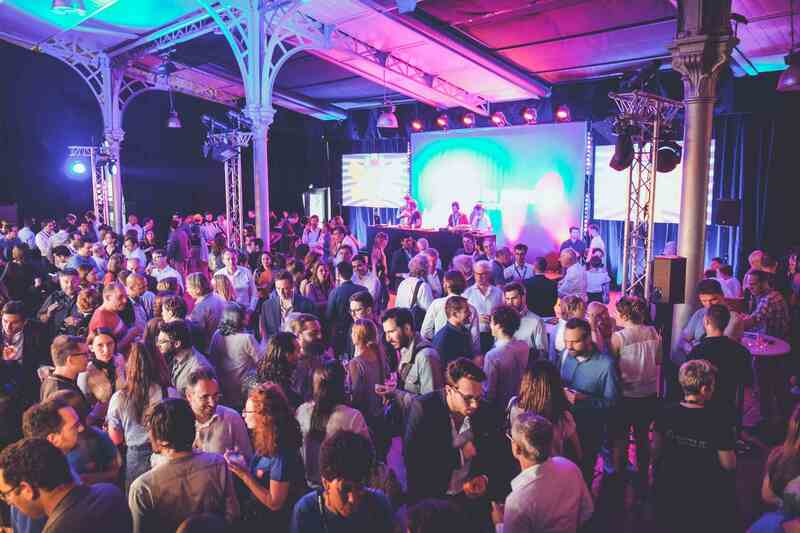 Thanks to the creation of a promising and fertile space of negotiation, the new format of Futur.e.s has confirmed itself as a promoter in the creation of business relationships in the new soon-to-be French “Silicon Valley” ambiance. 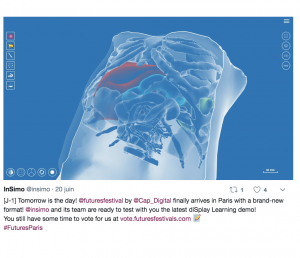 Re-live once again the best moments of the festival Futur.e.s 2018 with our storytelling on Twitter!